This is beautiful! I've only seen one or two episodes of Steven Universe (not the episode "Mirror Gem" in which she is debuted in unfortunately) but this is absolutely marvelous! I love the different hues of blue and how it looks like she's standing on a mirror almost like she's saying, "thank you for setting me free." Her wing like accessories are just stunning although they look like mere sketches with a white outline but the colouring they have is just phenomenal to me. Although the hand we can see does look a bit odd to me because it looks as though it's in a fist position one would see from a right side view profile with the right hand making that pose. This is still beautiful over all. 64 out of 70 deviants thought this was fair. I'd say gorgeous job. It's elegant colors to the phenomenal background. Now I am biased towards lapis, Pearl, and malachite right now, so of course I'd be all over this picture. It complements her colors so well, and really helps add effect. One thing I would probably be critical in wild most likely be her visible hand and her dress. The skirt looks almost bubbly and unlike her, and for me, it detracts from the picture. Her hand also Los bent in an odd way, and it looks odd. Other than that, I love the picture! Anyways, keep up the awesome work, and overall this picture is perfect! 57 out of 60 deviants thought this was fair. Such a beautiful painting! Applause. The water effects and the pose are both amazing! Beautiful work <3 I love The lighting as well. i know, I honestly didn't expect much from the show (figure sit would deb another adventure time random episode crap with few plots), oh if you take request, can you draw jinchurikis from Naruto as a gem from Steven universe? I 'm very curious to see what they would look like. brennst dich salzig in die Venen. in der Brust ein blauer Stein. in der Mitte tausend Falter..
fühle, dass ich so nur lebe. selbst wenn wir nur Träumen sollten." But her friendship comes through, subliminal! 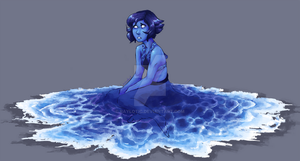 Lapis Lazuli, you were so mad but you came around to me! This was a very beautiful and stunning piece! pretty! nice job with the colors! Oh my GERD!!!!!!! This...this is so amazing!!!!!!!!!! Muc fun. . . muc. . .
just as beautiful as the actual stone! Ohhh this is AMAZING! I love the colors! This is really cool! I feel like I'm catching every little bit of detail in this picture.